The concept of social participation has become central in aging policy since the 2000s, framing a new trajectory for older people in terms of activity and social involvement. While we could consider such discourse as positive, positioning older people as social actors contributing to collective wealth, it also creates norms and expectations around the nature and level of participation that is to be achieved. On this participatory path, people aging with disabilities can be excluded, both because they do not meet health standards associated with “active” older people and because participatory settings are not adapted to their desires and needs. Within my doctoral research project (Social Work, McGill University), I undertook a three-year participatory action research (PAR) with a group of twelve people aging with severe disabilities, mainly related to mobility, hearing and vision. Hosted by a local community in Québec City, the Carrefour familial des personnes handicapées, the PAR was about co-constructing with participants new insights regarding their experiences of social participation. We explored questions like: How do people with a lifelong disability understand or give meaning to participation? 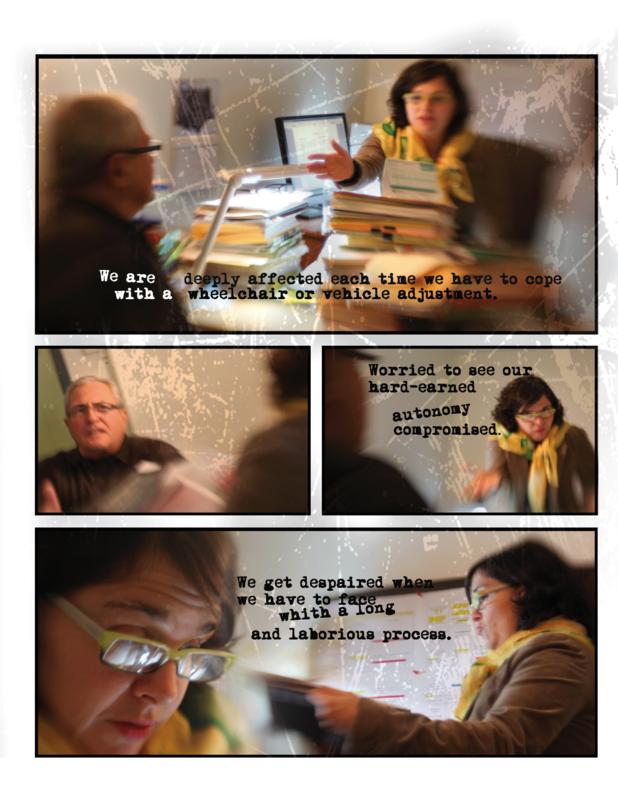 What do their stories, expectations and challenges reveal about practices of participation? To what extent do the socio-cultural constructs of ageing and disability, combined with social structures, influence their participation? The project took the form of creating a ‘photo novel’ whereby participants illustrated and narrated how they live and embody participation. They considered photos as an essential form of communication that helped them express how different bodies and environments impacted their experiences of participation. Participants met over 20 group sessions to craft accounts based on their stories of participation in society. The collective writing was followed by a series of photo shoots, with the participants as the main ‘actors’. Participants then selected photos to illustrate the written accounts, resulting in the production of a total of nine illustrated narratives. 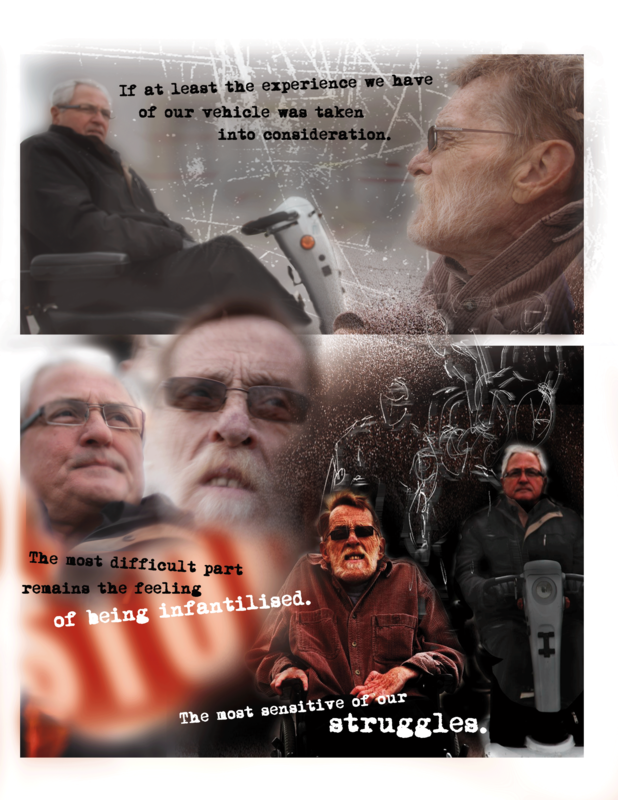 The Photo Novel Project can be read as a collectively produced story of aging with disabilities and an alternate account of participation. It clearly demonstrates the disjuncture that exists between the public rhetoric of participation as a health, activity and success (i.e., able-bodied and impairment free), and the realities of older people with disabilities. 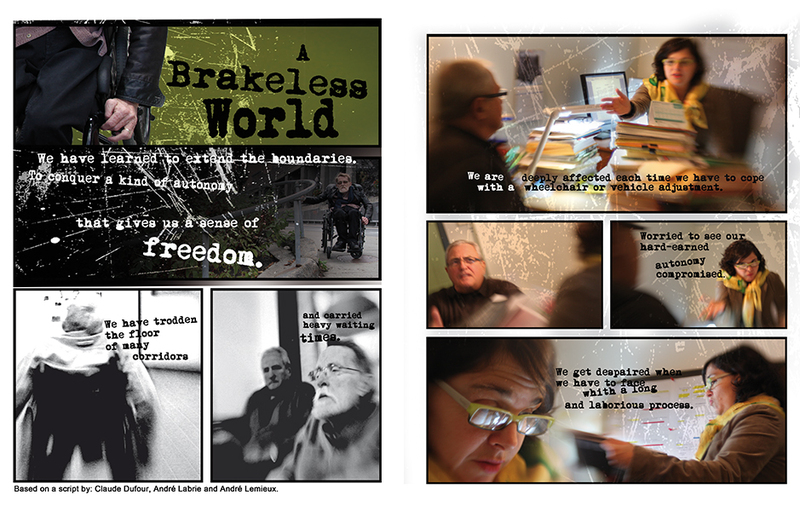 Accounts from the project create different narratives around aging, impairment and social participation – stories where older people with disabilities are depicted as citizens and insiders of everyday aging trajectories. The involvement of people aging with disabilities in PAR on social participation created a dialog and resulted in a transformative journey. A restoring process emerged from shared stories, from the ways in which participants performed and fashioned themselves and their visions of participation. The Photo-Novel members saw themselves as insiders; as producers of intentions, meanings, and changes; and as concerned, skilled, and connected citizens who fully challenged the ideas of weakness and passivity that exist in policy, scientific and media representations. The project also raised awareness about people aging with disabilities. In creating results in a unique format that could be shared with decision makers and the public, it drew attention to the inherent challenges of guiding discourses on participation. A key finding from the members of the Photo-Novel Project is how frameworks such as participation—when not carefully integrative of the needs of diverse groups— can exclude rather than include older people with lifelong disability in programs, services, and organizations that target the social participation of older people. Raymond, É., & Grenier, A. (2013). 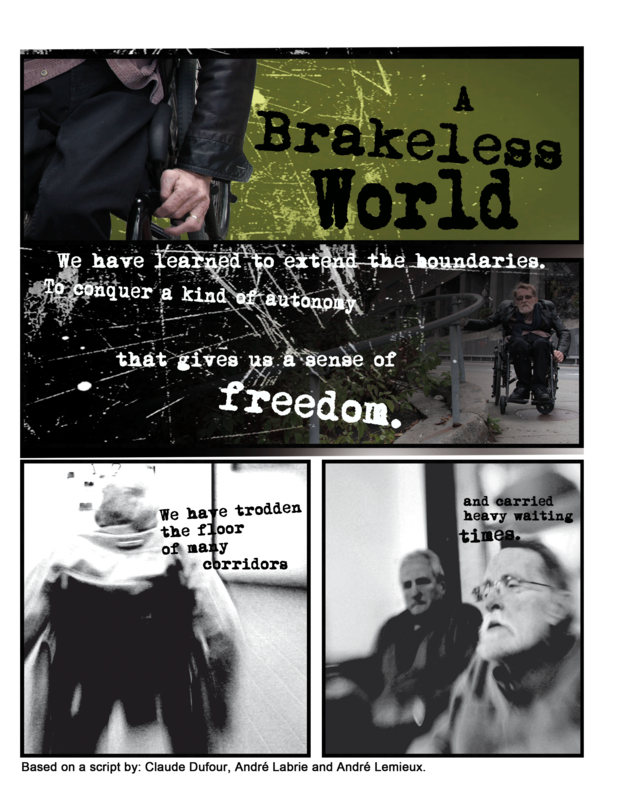 Participation in policy discourse: New form of exclusion for seniors with disabilities? The Canadian Journal on Aging, 32(2), 117-129. Raymond, É., Grenier, A., & Hanley, J. (2014). Community participation of older people with disabilities. Journal of Community and Applied Social Psychology, 24, 50-62. Raymond, É., & Grenier, A. (2015). Social participation at the intersection of old age and lifelong disability: Illustrations from a Photo-Novel Journal Of Aging Studies(35), 190-200. *These images were produced as part of Emilie’s project.